CHA Mark 50 - Unique Flexibility. Available in either right- or left-handed chamber control panel configurations, the Mark 50 features a horizontal chamber and unique slide-down door for easy loading and unloading. The system's rear door permits convenient access for through-the-wall mounting. Fixturing: A variety of fixturing options accommodate any wafer size up to 6 inches. 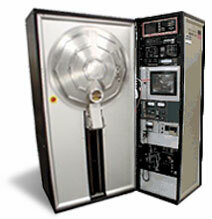 THE MARK 50....FOR VERSATILE, HIGH-THROUGHPUT DEPOSITION Rebuilt by CPA, Inc. The distinctive simplicity of design, combined with quality components and workmanship, ensures trouble-free performance and provides unparalleled serviceability. CHA's Mark 50 System is specifically designed for flexibility and long term reliability in high production semiconductor metalization environments. Offering up to 50 percent more throughput than any other system and handling wafers up to six inches, the system delivers unmatched operating efficiency. The Mark 50 accommodates a wide variety of deposition equipment, including source shutters, substrate heaters, wire feeders, deposition controllers and power supplies. A broad selection of fixturing, much of which can be interchangeable, is available for the Mark 50, including lift-off, flip-type, single- dome or custom. Using CHA's planetary fixturing, the system can process up to 108 3-inch wafers, 57 4-inch wafers, 39 5-inch wafers or 21 6-inch wafers in each deposition cycle. The Mark 50 also provides expanded choice in sources. The system can be supplied with any commercially available source, ranging from single and multiple electron beam sources, magnetron sputtering sources, and resistance sources to ion-beam sources and RF induction sources. For heating, the system can be equipped with quartz-lamp heaters of up to 16 kW to produce wafer temperatures exceeding 500°C. And the chamber is designed to accommodate either conventional or backside heaters, depending on specific requirements or system configuration.